We are not currently seeking applications for Resident Fellowship positions. Fellows will be in residence at Georgetown Law for a two-year period. The Fellowship permits Fellows to complete a year of research and writing and to teach a seminar before applying for teaching positions during their second year. During the Fellow’s tenure at Georgetown, he or she will be expected to produce at least one major academic piece of scholarship. The Fellow will be mentored by the faculty associated with the Center, working closely with his or her mentors in developing the major writing project. Evan Bernick is a Visiting Lecturer at the Georgetown University Law Center and a Fellow at the Georgetown Center for the Constitution. He was most recently the Assistant Director of the Center for Judicial Engagement at the Institute for Justice, the national law firm for liberty, which he joined in 2014. At IJ, Evan worked to educate the public and persuade judges about the need for judicial engagement—a novel framework for judging that equips judges to discharge their constitutional duties in every case. Before joining IJ, Evan was a Visiting Legal Fellow at the Heritage Foundation, where he focused on over-criminalization, constitutional law, and sentencing policy, among other subjects. Evan’s work has appeared in such places as Time, USA Today, and National Review Online. 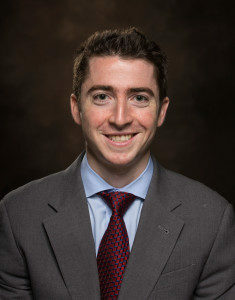 Evan has published with the New York University Journal of Law &Liberty, the George Mason Law Review, the Georgetown Journal of Law &Public Policy, and the Federalist Society Review. He received his J.D. from the University of Chicago Law School in 2011, and he graduated with honors from the University of Chicago in 2008.